Forty years after he first appeared in theatres, Michael Myers is still drawing huge audiences for a good scare. Universal Pictures said Sunday that Halloween took in an estimated $77.5 million US in ticket sales from North American theatres. It captured first place at the box office with the second-highest horror opening of all time, behind last year's It. It also marked the second highest October opening ever behind Venom's $80.3 million launch earlier this month. David Gordon Green directed Halloween, which brings back Curtis as Laurie Strode and Nick Castle as Michael Myers and essentially ignores the events of the other sequels and spinoffs aside from John Carpenter's original. Reviews have been largely positive for the new instalment, with an 80 per cent fresh rating on Rotten Tomatoes and a B+ Cinema Score from audiences that were mostly older (59 per cent over 25) and male (53 per cent). Internationally, Halloween earned $14.3 million from 23 markets. Blumhouse, the shop behind Get Out and numerous other modestly budgeted horror films, co-produced Halloween. It cost only $10 million to make. 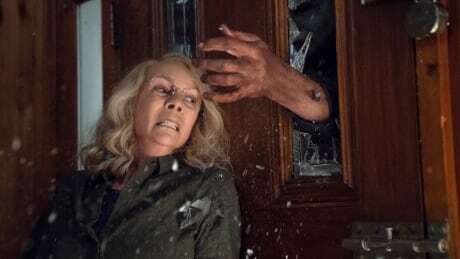 "You take the nostalgia for Halloween, especially with the return of Jamie Lee Curtis, and you combine that with the Blumhouse brand and its contemporary currency in the genre and it just made for a ridiculously potent combination at the box office this weekend," said Jim Orr, Universal's president of domestic distribution. With 10 days to go until the holiday, including another weekend, the studio expects Halloween to enjoy a much longer life than typical horror films that usually drop off significantly after the first weekend. Halloween was enough to bump the comic-book film Venom out of the No. 1 spot and into third place in its third weekend in theatres. It collected $18.1 million, bringing its domestic total to $171.1 million. Meanwhile A Star Is Born held on to second place in its third weekend with $19.3 million. The Bradley Cooper and Lady Gaga drama has grossed $126.4 million from North American theatres and is cruising to break $200 million worldwide Sunday. Damien Chazelle's Neil Armstrong biopic First Man tumbled to fifth place in its second weekend earning $8.6 million, down 46 per cent from its launch. It was a particularly busy week at the box office as critically acclaimed films such as the young adult adaptation The Hate U Give and the Robert Redford swan song The Old Man & The Gun expanded nationwide after a few weeks in limited release. The Hate U Give, now in 2,303 locations, placed sixth with $7.5 million, and The Old Man & The Gun took 10th with $2.1 million from 802 locations.